Quality is not just a word at Palmers but is at the heart of our company activities. For this reason, we have used internationally recognised quality assurance systems for over 20 years. Palmers Scaffolding UK Ltd has been registered to internationally recognised quality assurance systems standards since 1991. The company is a member of the industry association – National Access and Scaffolding Confederation (NASC). We actively participate in safety and technical committees, as well as adhere to the latest TG20:13 & SG4:15 guidance. All our scaffolding operatives are fully trained and card carriers of the Construction Industry Scaffolders Record Scheme (CISRS). 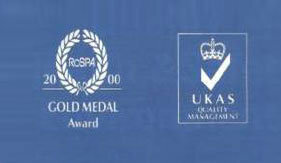 From 1995 to 1997, Palmers Scaffolding UK Ltd achieved the RoSPA Gold Safety Award and from 1998 to 2003 consecutively the RoSPA Gold Medal Award. To assist its customers and locations in striving for a safe working environment, Palmers Scaffolding UK Ltd has its own in-house Quality, Safety Health and Environment Department. This department works closely with the HSE and regularly audits the safety standards pertaining to its products and services. Would you like to learn more about Palmers Scaffolding UK Ltd‘ QHSE Policy Statements? No problem. Just click on the links below and then directly download the document as a PDF file. Palmers Scaffolding UK Ltd Ltd have received many accolades within the industry for their achievements and commitment to QHSE excellence and continuous improvement. Palmers are team players and their staff has the expertise and competency required for such a large scaffold/structural project. Palmers have a very good Safety, Health and Environmental ethos and take the training and competency of their staff and operatives as a priority. Palmers have had effective design management and the ability and attitude to resolve problems. Palmers were very professional in their actions and were timely and customer focused with an open and honest attitude. Palmers showed incredible innovation and deterrmination to deliver a temporary structure of awe inspiring beauty and impeccable practicality. Everything Palmers has achieved on the site is due to their high level of professionalism and the conduct of the staff and operatives has been excellent. N Turner - BAA Ltd.